I recently started organizing the postwar film materials in the Makino Collection. I began with Occupation Period (GHQ period/General Headquarters) materials that include promotional materials (mainly movie theater programs) from the Central Motion Picture Exchange (CMPE), est. Nov. 1946 as an arm of the Civil Information and Education Section (CIE) of SCAP (Supreme Commander for the Allied Powers). In addition, there are entertainment newspapers, labor union newsletters, and programs (various formats of handbills) of American film showings in movie theaters throughout Japan. These postwar movie theater handbills offer a nice comparison to the prewar movie theater handbills I have already processed in the Makino Collection. There are about 3,000 of the latter, all organized by location, movie theater name, and program title. Many were from the late 1920s and 1930s and can be found in Series 12, Movie Theater Handbills/Chirashi, circa 1870-1968 or for revues (non-film), see Series 13, Handbills/Chirashi for Shows and Revues, 1915-1947 of the still-in-process finding aid. The GHQ period handbills reflect the heavy promotion of American cinema under the Occupation as part of the “democratization” of Japan and the late 1950s addition of European films to the Japanese film market. This section also contains study-discussion guides from SCAP CIE. But, it mostly contains film production company (film studio) newsletters and bulletins. These promotional materials were published by the film production companies, Shōchiku/松竹, Tōhō/東宝, Shin Tōhō/新東宝, Nikkatsu/日活, Tōei/東映, Daiei (Kyoto)/大映(京都), and Daiei (Tokyo)/大映東京. They report the news of the film studios during the late 1940s and 1950s. Here, you will also find film workers’ union organ publications, including newsletters by the Japan Film and Theater Workers’ Union or Nihon Eiga Engeki Rōdō Kumiai/日本映画演劇労働組合, aka Nichieien. The collection of writings from the 1970s and 1980s about the 1948 Tōhō labor strike, Tōhō sōgi kenkyū shiryō shū/東宝争議研究資料集, complement materials that can be found in Series 4, Studio Files, Subseries 4, Tōhō/東宝, Box 82. There are some really interesting items in this section of early postwar materials, including an Oizumi Film Company Budget Report/太泉映画株式会社, which is a handwritten internal company document of the film studio that preceded Tōei/東映, dated March 1951. There are many film magazines and general magazines published during the Occupation period in the Collection that I will now start to process (more than 6 boxes worth). 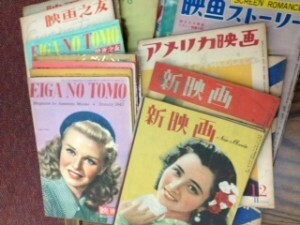 The magazines include originals of the important Eiga no tomo/映画の友 (Friends of the Movies), which Hiroshi Kitamura in his very useful book on this period, Screening Enlightenment: Hollywood and the Cultural Reconstruction of Defeated Japan (NY: Cornell University Press, 2010) has described as “a popular magazine that specialized in Hollywood cinema during the early postwar era…This popular publication inspired young people to form a larger community of Hollywood fandom in defeated Japan” (p. 156). The postwar period saw a rebirth of publishing with many film-related and trade magazines circulating around the country. I will next begin processing these magazines, some of which can be seen below. Perhaps my most interesting find in this series is a diary and correspondence of the Nichiei cameraman Taguchi Shūji/田口修治 who accompanied the military and was captured in the Philippines. In his prison diary, written in late 1945 and the first half of 1946, Taguchi records his observations of the war crimes trials of Japanese military leaders in Manila, along with a description of his daily food consumption, and quotations from novels he was reading at the time. 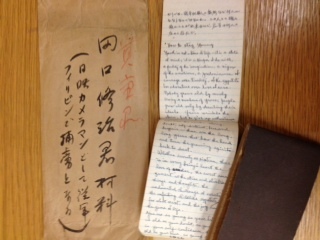 Taguchi’s correspondence to the writer Kimura Sōju/木村荘十also describes his view of the war crimes trials. As first-hand observation of the first of the war crimes trials from the Pacific War, this is fascinating material. In particular, I am currently taken with Taguchi’s transcription (in English) of the poem by Samuel Ullman (1840-1924), a German-Jewish-American poet and activist in Birmingham, Alabama. “Youth,” which became popular poem in Japan in the early postwar, was beloved and quoted by General Douglas MacArthur (and portions of it were later used by Robert F. Kennedy in his “Day of Affirmation Address” in South Africa on June 6, 1966). Taguchi records it in his diary on February 24, 1946. He may have heard it in a sermon by the prison chaplain (who Taguchi writes about on the page before he records the poem). I am not sure as Taguchi does not identify his source or the author of the poem. Youth is not a time of life – it is a state of mind; it is a temper of the will, a quality of the imagination, a vigor of the emotions, a predominance of courage over timidity, of the appetite for adventure over love of ease. Nobody grows old by merely living a number of years; people grow old only by deserting their ideals. Years wrinkle the skin, but to give up enthusiasm wrinkles the soul. Worry, doubt, self-distrust, fear, and despair – these are the long, long years that bow the head and turn the growing spirit back to dust. Whether seventy or sixteen there is in every being’s heart the love of wonder, the sweet amazement at the stars and starlike things and thoughts, the undaunted challenge of events, the unfailing childlike appetite for what next, and the joy and the game of life. So long as your heart receives message of beauty, cheer, courage, grandeur and power from the earth, from man and from the infinite, so long you are young. When the wires are all down and all the central place of your hearts is covered with the snows of pessimism and the ice of cynicism, then you are grown old indeed and may God have mercy on your soul. This entry was posted in Occupation Period and tagged Eiga no tomo, film magazines, film production company, GHQ, handbills, newsletters, Occupation period, Samuel Ullman, Taguchi Shuji on March 28, 2012 by Beth Katzoff.